Satisfy Your Spring Appetite With These 8 Dog-Friendly Restaurant Patios in St. Louis! The weather that everyone has been craving is finally here, and you know what that means. That’s right, it’s time to get outside and enjoy the beautiful weather out there! There are fewer things more wonderful than enjoying a delicious meal in the springtime sunshine. You know who else loves lounging outside and enjoying a tasty treat? Your furry friend! And you don’t want to say no to those sweet puppy-dog eyes, do you? Of course not! That’s why we’ve taken the liberty of getting a nice list together for you of some of our favorite eateries that have dog-friendly patios. The Boathouse at Forest Park – Looking for a classic, dog-friendly place to eat? Try the Boathouse. Take your pup for a jaunt through the park or chill out by the lakeside with your BFF, then head on over to get a good bite to eat. Enjoy your meal in the Adirondack chairs on the porch, sit back, and take in the beautiful weather! Brasserie by Niche – Are you a lover of French food? 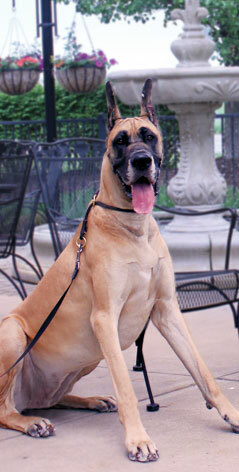 Then it’s time to head out to Central West End and give Brasserie a shot with your pup! Oftentimes in the spring, this French eatery will keep their doors open, and you can take advantage of their extensive sidewalk seating – just like a real Parisian brasserie. Take your pooch over for people-watching and relaxing as you enjoy brunch, lunch, or dinner outside. Bridge Tap House and Wine Bar – Take your dog for a nice walk downtown to see the sights and then take a break at the lovely Bridge Tap House. Your furry friend will be able to sit on the patio with you and will even be given a bowl of water to enjoy in the spring sunshine! Half & Half – If you’re looking for a country retreat but don’t want to leave the city, check out Half & Half in Clayton with your furry friend in tow. Its atmosphere and tasty food will make you feel as if you’re in your own little country retreat. Sit by the restaurant’s wrought-iron fence and gates outside and spend a leisurely weekend morning enjoying brunch with your faithful friend snoozing at your feet. Remy’s Kitchen and Wine Bar – If you’re in the mood for a delicious special and a glass of wine after playing fetch with Fido, then Remy’s in Clayton is right up your alley! No need to leave your dog at home; this eclectic place will allow your dog to join you if you choose to dine outdoors. Relax with your wine as your dog enjoys people-watching. Three Kings Pub – There’s much adventure and fun to be had in the Loop, and you don’t have to go all the way back home to drop your pup off if you want a bite to eat! Just head over to Three Kings Pub and park it at one of the several tables outside on the sidewalk. Customers will often bring their furry friends with them while they dine outside on tasty snacks and drinks! Water Street Café – Downtown Maplewood holds many great eateries, and Water Street Café is one of them! After a fun escapade with Fido, bring your pup down to the café’s patio for a great meal or a delicious bottle of wine. Your dog will even be treated to a big bowl of water as you sit back and enjoy the sites of downtown Maplewood. Wild Horse Grill – If you’re on the west side of the city and want to take your doggy with you to dine, check out Wild Horse Grill in Chesterfield. This dog-friendly restaurant features Pups on the Patio on Wednesday afternoons in which guests can bring their well-behaved pups and hang out. If you take advantage of Pups on the Patio, your dog will enjoy special doggie treats and a grassy play area to interact with the other pooches there! The owner is also known for bringing his own pet and chatting with patrons. There are countless other dog-friendly restaurants and eateries in St. Louis that feature delicious food. Check them all out here and here! What is your favorite place to take your dog to for a bite to eat? Let us know at our blog or on our Facebook or Twitter page. Now get out there and enjoy the beautiful weather with your pooch! This entry was posted in Fun information and tagged BauserHaus, Brasserie by Niche, Bridge Tap House and Wine Bar, dog-friendly restaurants in STL, Half & Half, Pups on the Patio, Remy's Kitchen and Wine Bar, The Boathouse, things to do in STL in spring, Three Kings Pub, Water Street Cafe, Wild Horse Grill. Bookmark the permalink.